Regardless of your age or physical health, it is always important to have regular eye exams. Eye examinations are an important part of health maintenance for everyone. Adults should have their eyes tested to keep their prescriptions current and to check for early signs of eye disease. For children, eye exams can play an important role in learning and development. Vision is closely linked to the learning process. Children who have trouble seeing or interpreting what they see will often have trouble with their schoolwork. Many times, children will not complain of vision problems simply because they don't know what “normal” vision looks like. 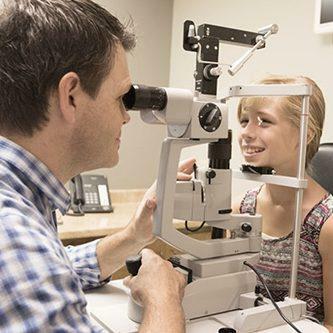 If your child performs poorly at school or exhibits a reading or learning problem, be sure to schedule an eye examination to rule out an underlying visual cause. For example, diabetes can cause small blood vessel leaks or bleeding in the eye, as well as swelling of the macula (the most sensitive part of the retina), which can lead to vision loss. It's estimated that one-third of Americans who have diabetes don't know it; your eye doctor may detect the disease before your primary care physician does, especially if you're overdue for a physical. WHAT'S THE DIFFERENCE BETWEEN A VISION SCREENING AND A COMPLETE EYE EXAM? Vision screenings are general eye tests that are meant to help identify people who are at risk for vision problems. Screenings include brief vision tests performed by a school nurse, pediatrician or volunteers. The eye test you take when you get your driver's license renewed is another example of a vision screening. Source: Importance of Eye Exams article by AllAboutVision.com. ©2009 Access Media Group LLC. All rights reserved. Reproduction other than for one-time personal use is strictly prohibited.